If by their nature initiatory rites and symbols contain a certain amount of mystery and secrets, access to historic feminine rites is almost non-existent. 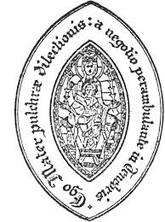 At the beginning of the 21st century, the Oblates of Holy Sophia (OHS) the Feminine Ordinal for Minor Orders uses the symbolism of the many forms of Sophia and the Mystery of the Bridal Chamber to lead the candidate through the Minor Holy Orders. ​Following CSM references to chivalric tradition, much of the feminine ordinal is adapted from Beguines, female religious groups that arose beginning in the 12th century, whose origins appear to be associated with the Cathar and Troubadour traditions. While Beguines eventually were forced into cloistered communities, they were initially women-at-large who lived with their families and came together for regular worship. When relating Feminine Holy Orders to modern Gnosticism, it is necessary to consider what a "feminine" approach is. The term "Divine Feminine" does not mean images of the Divine represented in female form. Rather, it is closer to what Jung called the "anima", or what Eastern philosophy calls the "yin" - it is that part of the psyche which is receptive, passive, and yielding. Alchemically it is the elements of water and earth. It is the emotional, feeling, and the unconscious.